The Intel 945 chipset started life many moons back, but with the introduction of the Intel Core 2 Duo processor manufacturers are scrambling to introduce a new class of 945 Express boards into the market at a feverish pace... If there was ever a time to be trend spotting in the tech world for killer hardware, it would have to be anything that runs a Intel Core 2 Duo. The mainstream Intel 945G Express chipset offers an incredibly affordable platform of complementary technologies for consumers to get excited about. Boards like the Gigabyte GA-945GM-S2 don't cost much, come with onboard video, have high definition content optimizations, and tick off all the major must have's for a modern PC. Cheap and feature packed, sounds like a winning recipe doesn't it? As PCSTATS embarks upon this review, it's worthwhile to note that Gigabyte and Asustek have merged forces and the resulting company now represents a significant portion of its industry. So far little has changed in either entities product offerings, but we'll certainly be watching the situation as it evolves. The microATX board accommodates a maximum of 4GB of DDR2 400/533/667 memory in a dual channel configuration. The GA-945GM-S2 supports all existing Socket 775 processors on a 1066MHz, 800MHz or 533MHz Front Side Bus (FSB), including the Intel Core 2 Duo, Pentium 4/D/XE and Celeron CPU. 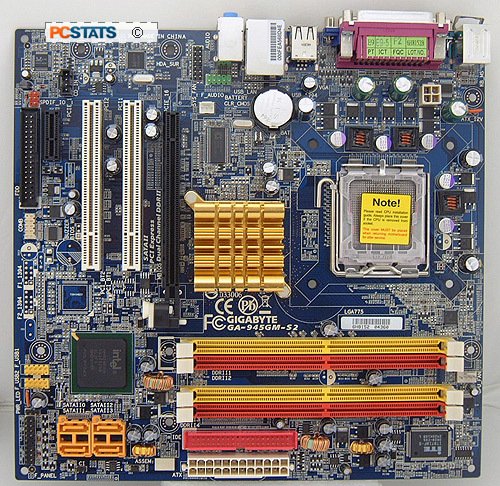 For the purposes of this review, PCSTATS will be testing the GA-945GM-S2 motherboard with a nice and shiny 2.4GHz Intel Core 2 Duo E6600 processor. On the short list of the GA-945GM-S2's hardware goodies we find an integrated Realteck 8111B Gigabit network card, Intel Azalia High Definition 7.1-channel audio codec (surround sound cable required, not included), four USB2.0 jacks, four 3GB/s SATA connections and of course the onboard Intel Graphics Media Accelerator 950 (a.k.a. GMA950) videocard at the rear I/O. There aren't a whole lot of expansion options beyond all of this, but the important bases are covered. The Gigabyte GA-945GM-S2 has a PCI Express x16 slot for a stand alone videocard, one PCI Express x1 slot for high bandwidth devices and two 32-bit PCI slots for legacy hardware. Four 3GB/s SATA channels and a single IDE channel (up to two Ultra DMA100/66 devices) encompass all the storage possibilities of the GA-945GM-S2 motherboard. RAID is not supported in any form. There's a floppy connector if you still use those little 1.44MB slabs of plastic. 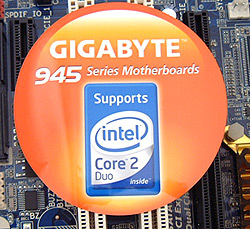 The Gigabyte GA-945GM-S2 has a retail price of $115 CDN ($100 US/£55 GBP) , which makes it a great multi-purpose platform with which to build an inexpensive Intel Core 2 Duo-based computer from. With passive cooled heatsinks on both the Intel 945G Express and Intel ICH7 chipsets, there are no fans to add noise or fail in the long term either, so it's a quiet platform on the whole. The layout of components on the GA-945GM-S2 is organized and generally easy to access. 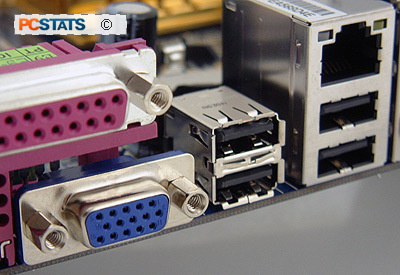 If a PCI Express x16 videocard is installed, it will need to removed before the DD2 memory can be inserted, but this is a common formality with microATX motherboards. The GA-945GM-S2 is equipped with a 24-pin ATX power (20-pin compatible) and 4-pin auxiliary 12V power connector. It's best to use a power supply with a minimum 300W rating. I don't think anyone is really happy with Intel for dropping an IDE channel, but such is the case with the Gigabyte GA-945GM-S2. If you are building a completely new system ensure all hard drives are SATA, and leave the IDE for optical drives like a DVD-RW or CD-burner. Rather surprisingly, the Realtek 8111B Gigabit network card connects to the Intel 945G Express chipset over a dedicated PCI Express x1 bus. Nice! There's nothing particularly noteable bundled in with this motherboard, and certainly no brackets for the PCB-level USB headers or to take advantage of the 5.1/7.1 HDA surround sound capabilities. The driver CD includes a copy of EasyTune 5 and a Windows based BIOS update utility. Gigabyte is a bit stingy with what's bundled in along with the GA-945GM-S2 motherboard, and that leads us to wonder why tossing in a couple little brackets is so hard? The user's manual that accompanies the GA-945GM-S2 is well written, and will guide newbie and expert alike through the pertinent steps of getting this board up and running. The bright blue motherboard PCB is fairly well labeled; most headers and ports have a description close by. For a detailed guide on the subject building your own computer see PCSTATS Beginners Guide to Assembling a PC, or any of the other Beginners Guides for that matter. One of the greatest aspects of the Gigabyte GA-945GM-S2 motherboard is that is comes with it's own graphics card built right in. There is a PCI Express x16 videocard slot if you wish to use a stand alone graphics card, and if you play a lot of first person shooter games you will, but if you don't, or your budget's tight the integrated Intel GMA950 videocard is there. The Intel Graphics Media Accelerator 950 is DX9.0 compatible and adequately suited for 2D workloads in Microsoft WindowsXP or Windows Vista. The GMA950 runs on a 400MHz 256-bit graphics core and has an assortment of technologies to make playback of 1080i high definition (HD) content on your computer monitor run smoothly. High definition output over component (Y, Pb, Pr) or HDMI cables to an external HDTV is not supported on the Gigabyte GA-945GM-S2, although devices called Media Expansion Cards (MCE) apparently bring added functionality in this respect. The GMA950 supports screen resolutions as high as 2048x1536 at 75Hz via a single analog VGA jack at the rear I/O panel. PCSTATS will be running a pair of 1080i and 720p high definition video's through the onboard GMA950 graphics card to see how it handles the load a little bit later in this review.